How Often Should I Charge My Golf Cart Batteries? Home GOLF CART BATTERY TIPS How Often Should I Charge My Golf Cart Batteries? Golf carts are the most comfortable vehicle to use around a golf course. It is specifically built to work on the terrains of the golf course. Golf cart owners often asked this question, how often should I charge my golf cart batteries? As we know, most golf carts are electrically charged. Most of the time, golf cart owners don’t know how much time is needed for charging, or they could be charging it more often than usual. Experts would say that you should charge your batteries right after every use. Others would recommend that you should never allow your cells to go below 70% of the charge. Both of these are correct. Golf carts needed an utterly full load every time, especially if you have been using your carts more often. Cart batteries are also expensive, so it is not a good idea to be changing batteries now and then. You can save up a lot if you know the proper ways of charging your cart cells. There are ways for proper cart battery maintenance. Every golf cart owners need to know the basic of adequate support for their cart batteries. It will save them time, money and effort to properly care for them. Deep cycle batteries need proper care and maintenance to improve and strengthen its overall performance. For new golf cart owners, it is important to read on and learn many things about caring for your batteries. Beginners would plug the charger into the outlet, and in 5 seconds they will hear that it is automatically turned on. We will share some tips on how to properly charge your cart batteries. Things you need to know, and these are the basic knowledge that you should apply if you want an extended battery life for your cart. So, how do you get the most out of your golf cart batteries? As owners, you must do everything to make your things work correctly. In the first place, golf carts aren’t a cheap item. Everything that goes with it also comes with a price, and that includes the battery. Of course, we do not want to be changing our golf cart batteries now and then. To replace batteries is a lot of hassle, but to avoid that, we need to make a little sacrifice like maintaining and caring for your cart batteries. You can do this by continually charging your golf carts after every use. 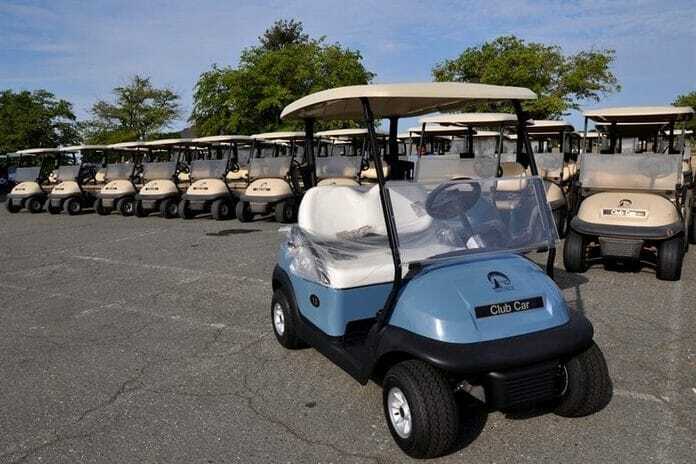 It can be a little frustrating to golf cart owners as most of them do not want to charge their carts every time, but that is how you can maximize your golf cart batteries, Prolonging your battery life entails a little sacrifice, and that means charging your cart after every use. How can you maximize the use of your golf cart batteries? Take a look at these considerations and see how well you check and cared for them. Owning a golf cart is not easy. Considering the price, you have to find time to care for it or else you just put everything including your money to waste. Golf carts maintenance begin with a good battery. See how you can get the most out of your cells. The only problem with using chargers for golf carts is the danger of overcharging it. Yes, you need to charge them after every use but not to overcharge them. If you overcharged your batteries, it will cause damage to your cells which may shorten its lifespan. Latest golf cart models have an automatic charger. The charger automatically shuts off when the battery is full. However, older golf cart models do not have this feature. So, you need to monitor the charging time carefully. It will be better if you will be using an alarm to tell you that charging time is over. It is therefore recommended to charge your golf cart batteries after every use. Do not attempt to drive your carts until it dies down, and it will create a lot of damage to your cells. You may also use a Dual-Pro charger. It can help in prolonging the life of your battery. It is a sophisticated charger which gives a precise charge for your batteries in full automation. It increases your battery life for about one-fifth. It means that you don’t have to change batteries as often as possible. Proper maintenance for your batteries requires a regular check-up. It also includes checking the water level of your cells and ensure that it is free from dirt and dust. It is equally important that your cells are free from acid leaks and corrosion; it contributes a lot to the weakening of your batteries. You can use baking soda and water to clean your battery terminals and poles. Make sure that you dry them up thoroughly. When watering your cells, you should keep in mind to use distilled water instead of ordinary tap water. How you use your golf carts determines the life of your batteries. When you use your golf carts, do not leave it on for a long time. Turn off the ignition and all accessories like lights and radio. It discharges the battery if there are any electronic devices open in your golf carts. For gas powered carts, jumpstarting it will resume its power, electric golf carts need charging. Be responsible by checking everything before you leave your vehicles. Also, you must avoid running through steep hills and moving with tons of loads. Know the right weight capacity of your golf carts. Carrying too much can slow down your carts and may cause the battery life to shorten. If you are using the vehicle for a long distance, it will be wise to use a trailer truck to carry your cart. Following these simple tips is relatively easy. Observing this proper maintenance will maximize your battery use for up to five years. However, when your batteries stop working, you should replace it right away and make sure that you find the best replacement for it. Proper charging and maintenance is the key for longer battery life for your golf carts. But, what if the charger itself is the problem? This problem is one of the most common nightmares of golf cart owners. When you think that the battery is the problem because it no longer charging, when in fact the real problem is the charger itself. How can we determine if it is a battery or a charger problem? There are ways in which we can tell if the question comes from the battery or the charger. One of the common reason which may cause a charger to stop charging is the low acid levels or if it leaks. Shortage of power may come from two reasons, the battery or the charger itself. These two, battery and charger both send the same signal of loss of power or low power when it has problems. These are the simple steps to take to check if it’s a battery or charger problem. 1. Turn on the charger. See if there is any power received by the cart. You can use a voltmeter to check the amperes received by the golf cart accurately. If the needle points to the left, it is not charging. If the needle points to the right, then it is receiving a proper charge. 2. Check the battery cables. Turn it on and then turn it to auxiliary only. If there is no power, then there could be a problem between the connection of the charger and the battery itself. 3. Check your battery transformer. When this is turned on, you can vividly hear the humming sound which means that it is fueling up the electricity. The humming noise is the clear indication that electric current is getting in and being used up. 4. Check the wiring circuitry too. The owner’s manual has the wiring diagram. See to it that the connections from the cart charger going to the battery is clean and free from fray, cuts, and corrosion. 5. Look for the ground wire. If the ground wire is disconnected, it will not charge the batteries. 6. Check for the battery fuse located in the back fender of the service panel at the back of the cart. If the charger fuse is blown, it will not charge the battery too. 7. Remove the caps from your battery. A gray or brown liquid present in the array already calls for a replacement. This condition will also be a reason for not charging it properly. You should replace the battery soon. Both the charger and the battery work together to give you an energy efficient golf carts. Damage in any or both will surely cost you a lot. So, charge your batteries properly, and you can be sure of longer battery life. Those who were asking, how often should I charge my golf cart batteries are now enlightened. Golf cart batteries should never be over or undercharged. Make it a rule to charge it after every use. Be a responsible owner by adequately maintaining your golf carts.